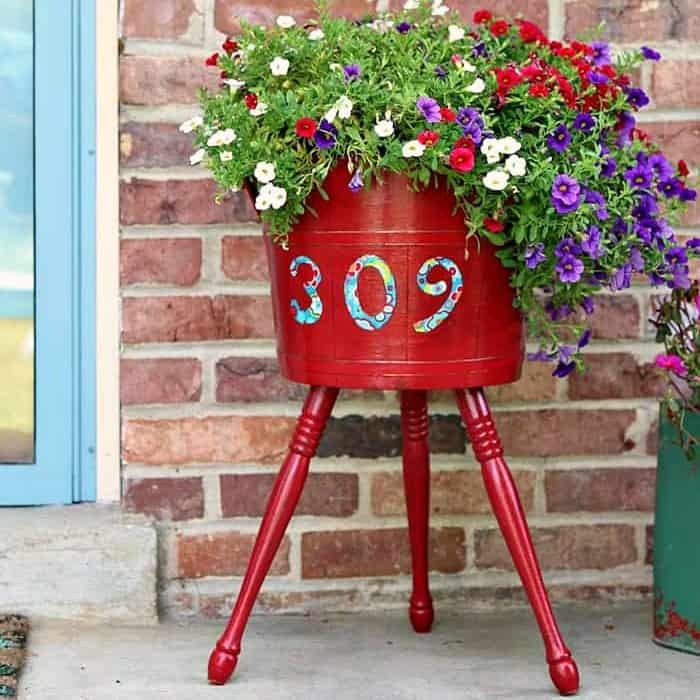 I never thought we would have a spray Mod Podge formula, did you? Well, it’s here and it’s awesome! What will they think of next. 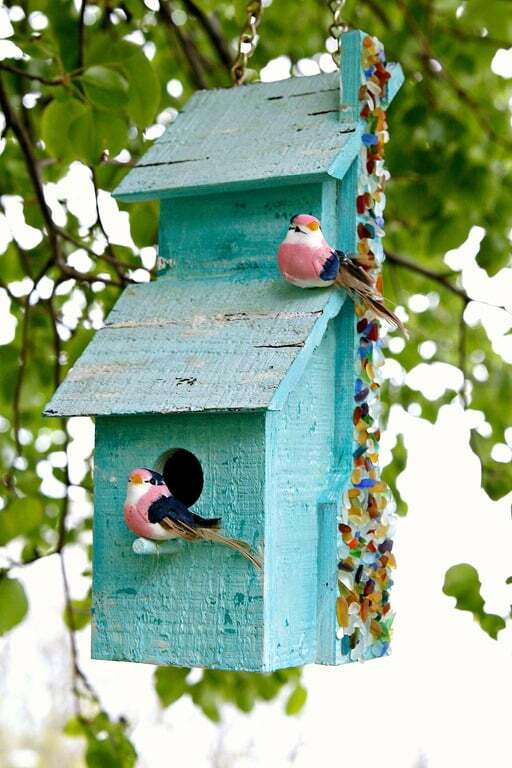 It’s called Mod Podge ® Ultra and I used the spray to update an ugly birdhouse I found at the local flea market. 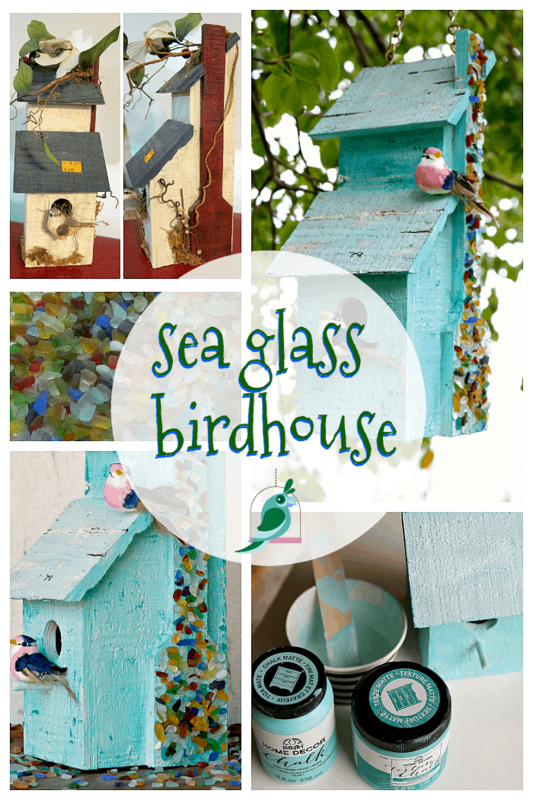 The spray Mod Podge worked great for gluing sea glass to the wood birdhouse. And it dried clear, and not gunky, and not tacky. You can glue beads, jewelry, sea shells, etc. to your projects with this product. 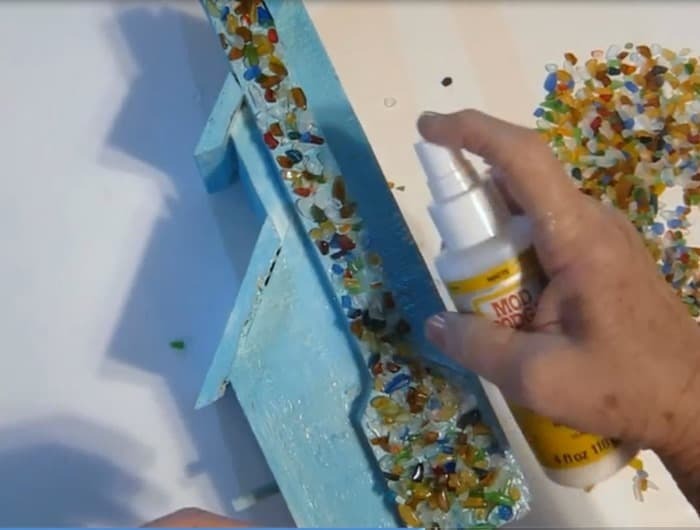 I made a video of the birdhouse makeover so you can see exactly how easy it is to use the spray. Disclosure: This post is sponsored by Plaid Crafts as part of the Plaid Creators program. All words, project ideas, and opinions are 100% my own. 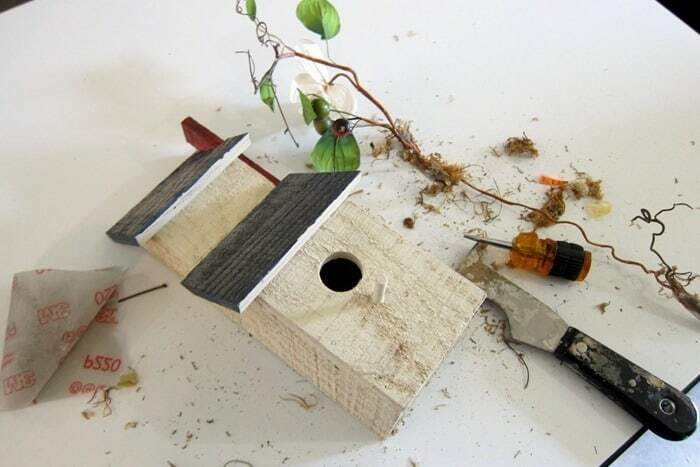 The birdhouse makes me smile. It turned out better than I expected. Wait until you see what I started with. This tacky thing. 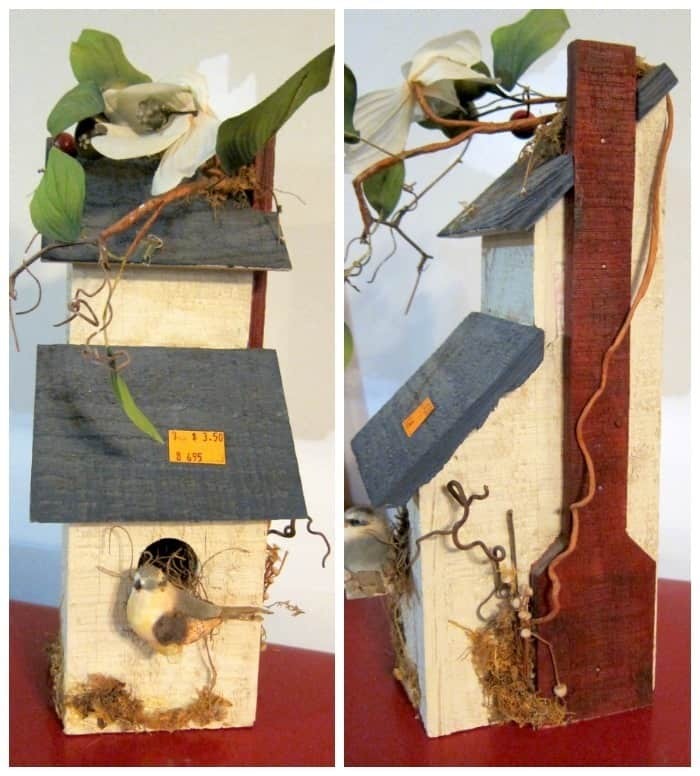 The birdhouse was probably stylish at one time (or not). I could see potential and the price was right, $3.50, so I brought it home. The first step in the makeover was removing all the “stuff” from the house. I used flexible sandpaper to remove the last bits of hot glue and gunk then washed the house using Simple Green. For the paint I selected four colors of FolkArt Home Décor Chalk Finish paint. You guys know that layering paint makes everything better. One color paint finishes are flat and blah. We’ve talked about this before. 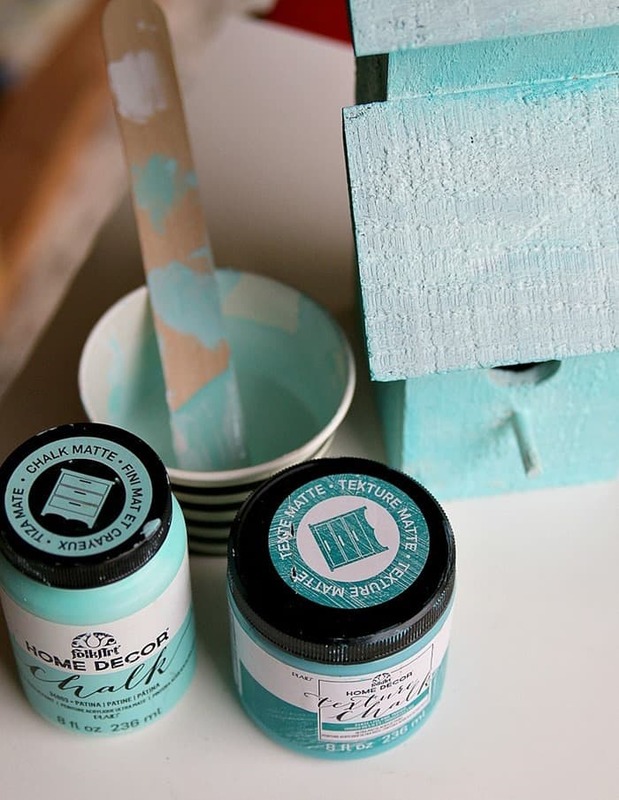 I mixed Home Décor Chalk colors White Adirondack and Patina to make a light turquoise color. 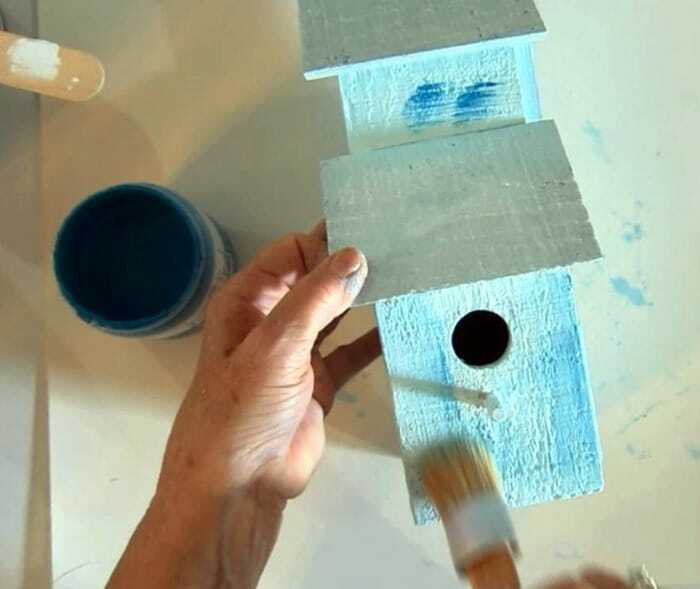 I brushed on the light custom mix color, let that dry, then brushed on Home Décor Chalk color, Patina, in a few areas on the birdhouse. 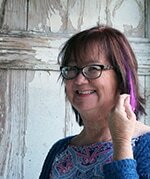 Next I brushed on a deeper blue in the Home Décor Coastal Texture paint, color Island Indigo, just dabbing and brushing it here and there. Now we have a custom paint finish with shading and depth. 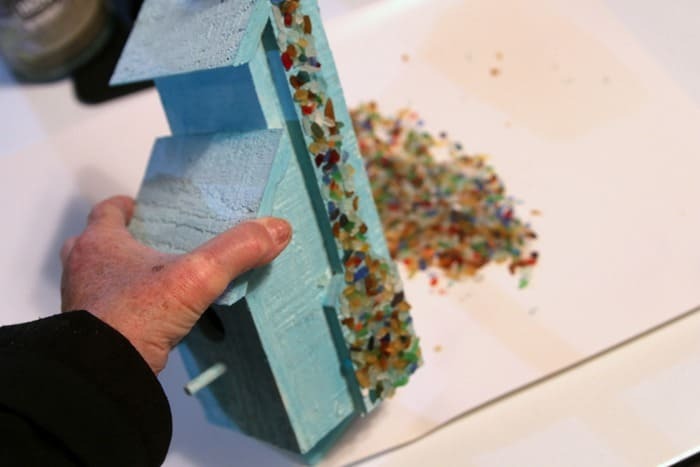 Time to glue the sea glass to the birdhouse chimney. Before using the spray I primed the pump to get the Mod Podge moving. I then sprayed the chimney coating it completely. Sorry for the quality of the photos. I made a video of the process but didn’t take a lot of time to do extra photos while I was working. These photos are screenshots from the video and the color is a little off. 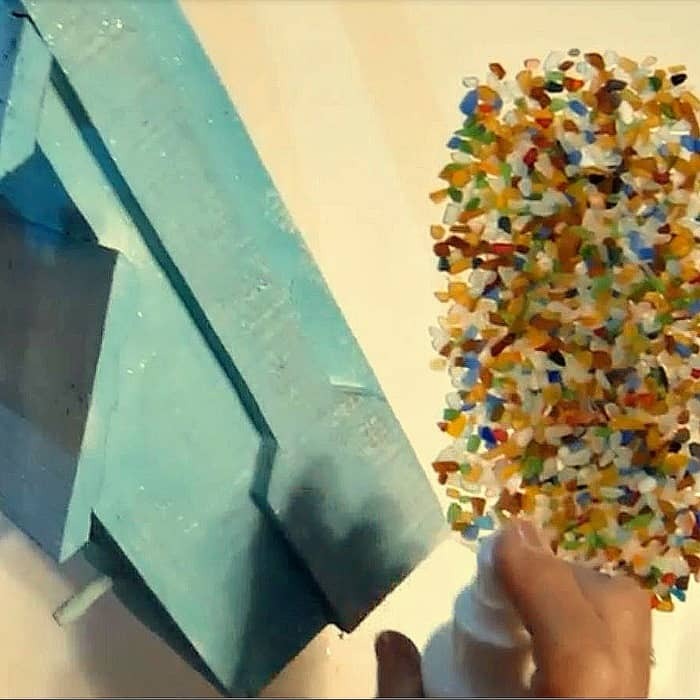 I laid the sea glass on the Mod Podge coated chimney then sprayed a coat of Mod Podge over the sea glass. You don’t have to worry about overspray because the Mod Podge is not tacky when it dries. I forgot to mention I bought the sea glass years ago on eBay. Never really used it for a project until now. 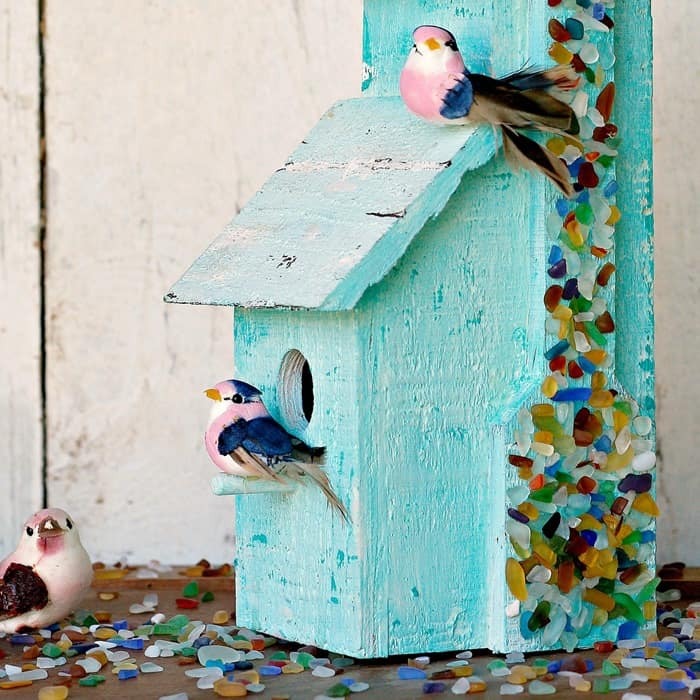 I let the sea glass and Mod Podge set overnight……. then came the test. See, I was questioning the process a little bit and not sure if the Mod Podge Ultra would keep the sea glass in place. It did. Happy Dance time. Next step in my plan is where the project took a turn. 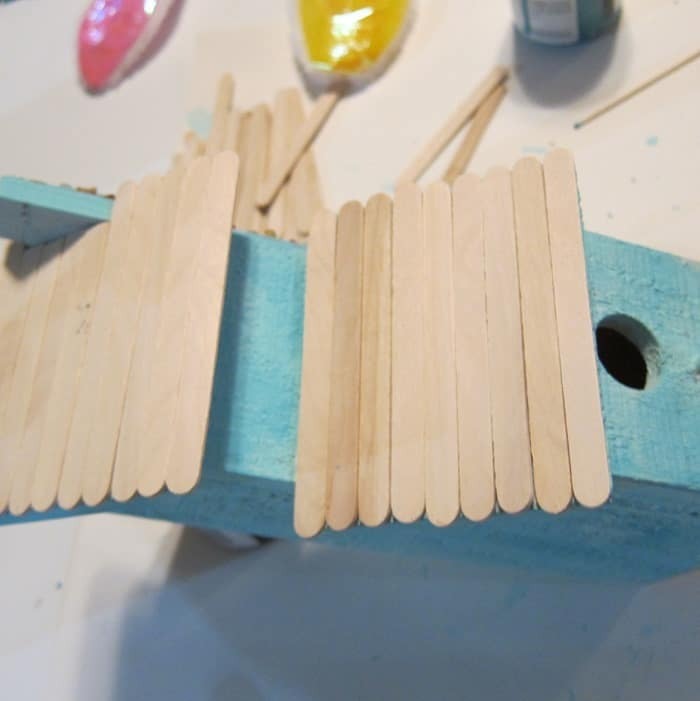 I used the spray Mod Podge to glue popsicle sticks to the roof of the birdhouse and the spray Mod Podge did it’s job, that wasn’t the issue. I painted the sticks dark brown and brushed white paint over the brown for a white wash. Hated it. I pulled all of the sticks off….and let me tell you, they were STUCK. Now my roof plan was shot to heck. What was left after I removed the popsicle sticks were a few areas where the brown and white paints had seeped into the crevices between sticks. I thought the roof looked pretty good like that but needed a second opinion. Hubby and a neighbor who just happened to walk in during the roof fiasco said they liked it. Good enough for me. Well, now I didn’t have to come up with another roof plan and the accidental roof finish was perfect. Sometimes things do work out. 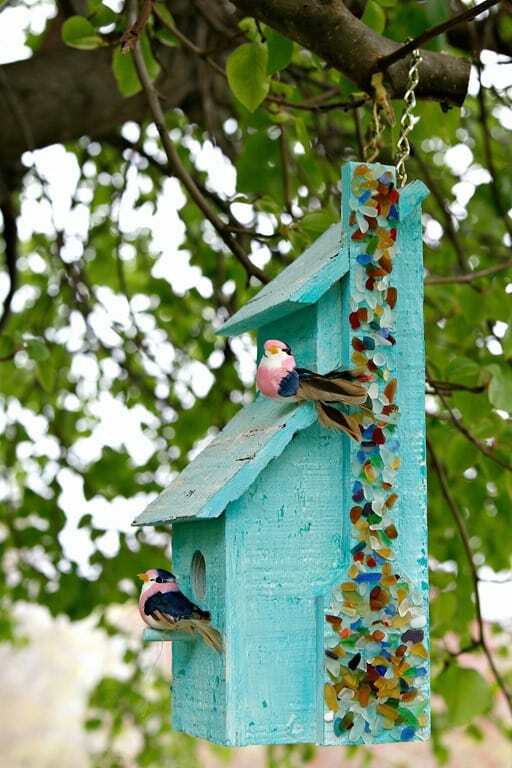 I sprayed the whole birdhouse with Mod Podge Ultra to seal the paint so I could hang the birdhouse outside. I added a metal chain hanger to the top of the birdhouse and hung it in the Bradford Pear Tree right outside the workshop door. The little birdies on the house came from Michael’s. 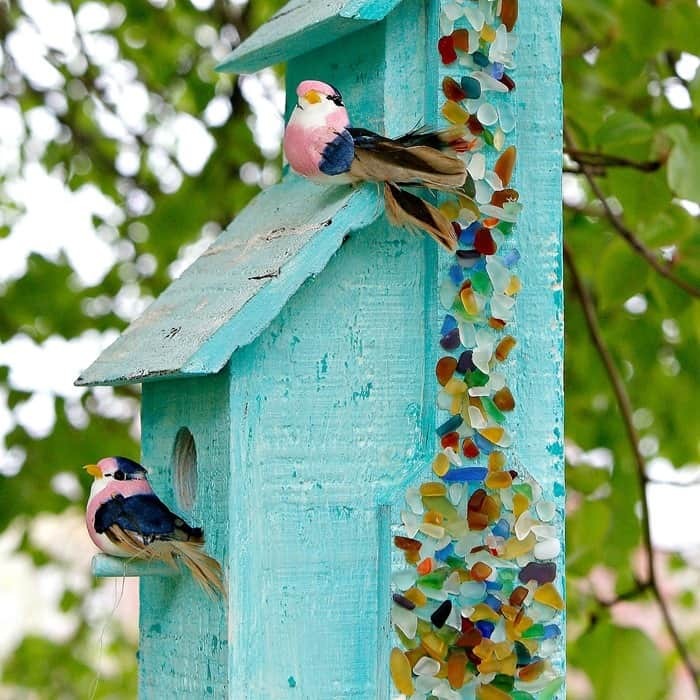 The original bird was a bit frumpy and wouldn’t do at all for the stylish sea glass house. Time to view the video which tells the story a lot better than I just did. 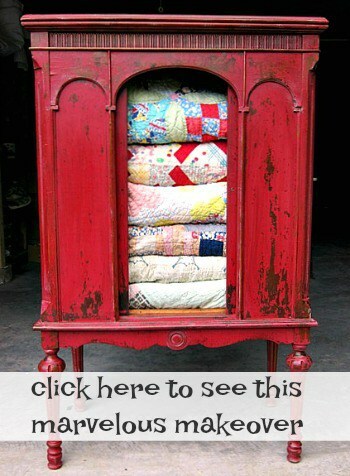 Want to see more of my Mod Podge projects…. 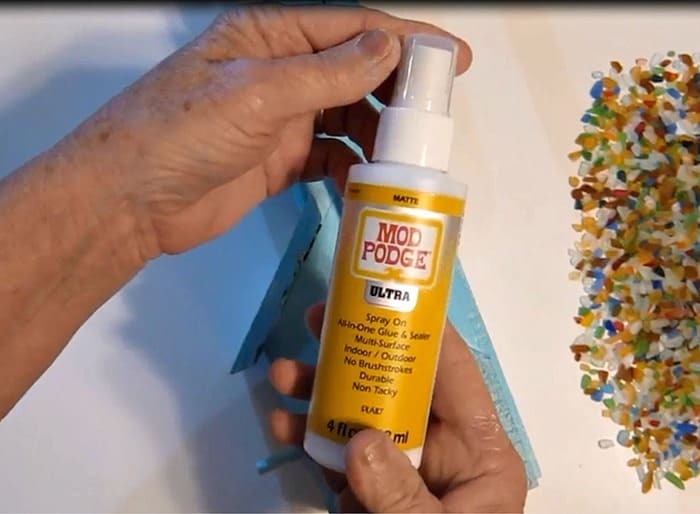 About Mod Podge Ultra: Mod Podge Ultra is a super strong, non-toxic spray formula that works as all-in-one glue and sealer with a high adhesion level—perfect for adding dimensional design embellishments to your projects. The versatile, water-based formula dries quickly and naturally self-levels, leaving no brush marks. It comes in both Matte and Gloss finishes. 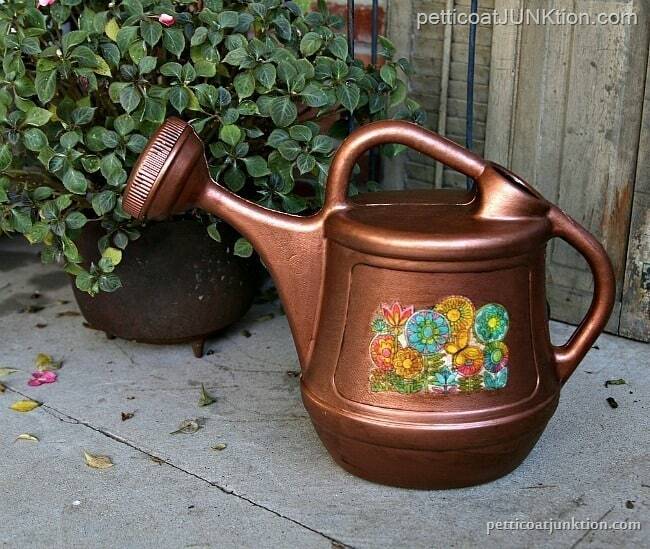 Mod Podge Ultra cleans up easily with soap and water, and comes in a convenient spray bottle. Find Mod Podge Ultra at your local craft store. This is absolutely adorable, love it! Kathy, this birdhouse is perfect. You did a fantastic job! Thanks. From tacky to terrific! 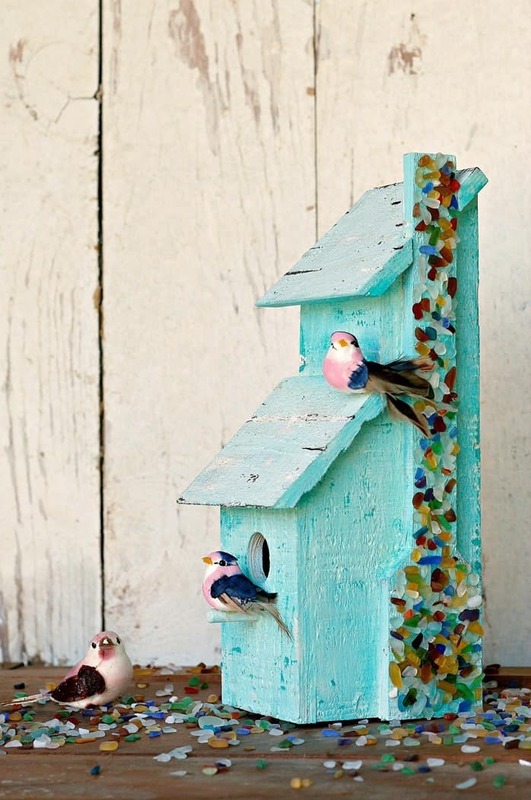 Love the birdhouse. I’ve been using Mod Podge for years and wish they’d come out with this way back , the mind reels with possibilities ,collages ,jigsaw puzzles and all the crafts from bits and pieces. It would have saved a lot of time . I’ll definitely be looking for this with a huge hint of putting this on the BUY list for all our adult crafting kids as stocking stuffers and Easter basket fillers or birthday boxes. We’re smack at the end of DIYing the third wedding in two years . Oh, that I knew this sooner. We’re all big recyclers, thrifters, auction hunters and repurposing . Huge thumbs up for this one. Thanks so much.